Graham was born in Rugby in 1952, the youngest of 4 brothers, and grew up on the nearby family farm. In addition to farming, his father was a wholesaler of meat throughout the Midlands from his abattoir in Rugby. Graham was educated at Lucton School, Herefordshire and then at Blackpool College of Technology & Art where he attained the Institute of Meat Final Certificate. Upon leaving college, Graham joined his 3 older brothers developing the meat business. Over a period of years, the operation was moved to Crick in Northamptonshire and, employing 1,200 people, became the largest beef slaughtering plant in Europe. As Plant Director, Graham ran the factory. In the mid-1990s Graham founded Butcher’s Pet Care using by-products to produce top quality pet food. After the BSE Crisis, the meat plant was closed and a new pet food plant built, this is Graham’s business today. Butcher’s Pet Care is one of the largest pet food canning plants in the world, producing 6 million products per week. In 1992, Graham married Elizabeth who, at the time, was an Assistant Solicitor at Slaughter and May. Elizabeth was proudly clothed as a Liveryman in 2018. They have 3 children and Graham has 3 children from a previous marriage. 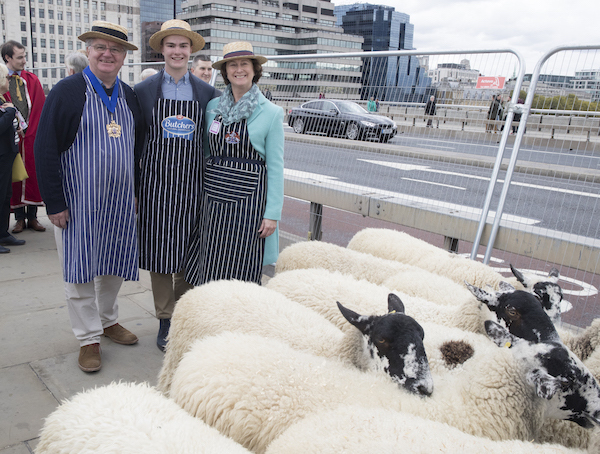 Graham is a Fellow of The Institute of Meat, a Member of The Institute of Directors and a Patron of The Prince’s Trust Enterprise Fellowship. Graham was the recipient of The Meat Management Excellence Award in 2016. Graham’s interests are his family, Rugby football, shooting and Sudoku. Wardens, Assistants, Past Masters, Liverymen and Clerk. Thank you for the great honour of electing me to be your Master for the coming year. I hope that I prove worthy of your trust and represent this proud and ancient Company in a manner befitting its history. Before setting out my goals for the year ahead I would like to pay tribute to the outgoing Master, Geoff Gillo. This has been no ordinary year for a Master. It hasn’t just been a year of turning up for pleasant lunches and dinners, it’s been a real hard graft. The start of the rebuilding of the Hall has been a great challenge. Many of you will be unaware of the extent of the effort required to ensure it happened. You may also not know that there was a real chance that it might not proceed at all as the finance was so tight. Geoff has also overseen the restructuring of the committees to meet the new challenges. This, on top of attending some 200 events and Glenise 150 – possibly a record! I am sure time will show the great work they both have done. I intend to continue his work, see the Hall re-open on time and consolidate the committee structure. The Clerk has already elaborated the progress of the redevelopment. It is on track both in timing and cost, although it is exceptionally tight. It is imperative that we have the Hall back in June to allow the final fit out for a September opening. It is a personal target of mine to hold the September Court Lunch (my last as Master) in the Hall, followed a week later by Common Hall. The first in House for five years. This is not just a minor ambition: we are desperately relying on Hall income from September. Life’s Kitchen – our venue managers - are now actively marketing the Hall for events from September. Butchers’ Hall is our Hall and we all need to help market and use this prestigious facility. For trade meetings and events, company AGMs, for private functions and celebrations. And, if you feel inclined, from 2020, weddings. It will be a great venue; please use it. I cannot over-emphasise the importance of the trading income to insure the future of the Livery as a whole. We are hoping Past Master The Princess Royal will formally open the rebuilt Hall in either October or November. This will be a great opportunity for the Livery and the publicity would be very welcome. The life of the Livery continues and the fellowship which is the heart of the Livery and has held up so well in our itinerant years. However the lifeblood of any organisation is recruiting new people. We wish to recruit the next generation of Liverymen and we are aware that times are changing. This Company has to appeal to people within the meat industry up and down the country. I hope I have the opportunity to visit some meat plants to further this aim. Please help recruit. We are holding smaller events to encourage engagement and fellowship with the widest possible number of our members. Give a one-off lump sum donation. Contribute towards or sponsor the purchase outright of furniture or fittings within the Hall. During the course of the next few months the annual donations we give to the two charities we currently support through our charity investment fund will be reviewed. This is where we give a three year commitment to support their work. If anyone has a good cause they wish to support please let us know. Finally, I would like to introduce my personal charity for the year. In the same week in May 2008 two things happened, I was asked if I would be willing to join the Court at WCB that coming September; two days later my wife Elizabeth was diagnosed with Parkinson’s Disease. Because of that I nearly did not join the Court but she insisted that I did and that we would make it work. We became aware of a charity, The Cure Parkinson’s Trust and we were most impressed with its work in both sponsoring and coordinating worldwide research into this debilitating condition. We have therefore arranged a dinner and fundraising event to be held in the Guildhall on Friday the 17th of May. We will work with The Cure Parkinson’s Trust to make it an enjoyable and successful evening. Whatever is raised on the evening I will donate the equivalent sum to the Masters Million appeal to make sure it doesn’t miss out. I am so pleased that my nephew, Assistant David Baker is leading a team of Liverymen and family in an ascent of Kilimanjaro in March, a brave venture. Proceeds will be equally divided between The Cure Parkinson’s Trust and The Master’s Million. This is your Livery and its future is in your hands and I look forward to working with members of the Court, our loyal staff and Liverymen generally to forward our aims. Thank you for putting your faith in me. As Liz and I look forward to the challenges of the year ahead I will do my utmost to justify that trust.